It has been suggested that Karha (spices) be merged into this article. (Discuss) Proposed since May 2018. Masala chai (/tʃaɪ/; literally "mixed-spice tea") is a flavoured tea beverage made by brewing black tea with a mixture of aromatic spices and herbs. Originating in the Indian subcontinent, the beverage has gained worldwide popularity, becoming a feature in many coffee and tea houses. Although traditionally prepared as a decoction of green cardamom pods, cinnamon sticks, ground cloves, ground ginger, and black peppercorn together with black tea leaves, retail versions include tea bags for infusion, instant powdered mixtures, and concentrates. The term "chai" ultimately originated from the Mandarin Chinese word for tea 茶 chá (The English word tea, though, comes from the Hokkien Chinese tê) and the Hindustani word “chai.” In English, this spiced tea is commonly referred to as masala chai or simply chai, though the term refers to tea in general in the original language. Numerous coffee houses use the term chai latte or chai tea latte (essentially meaning ‘tea tea latte’) for their version to indicate that the steamed milk, much like a regular caffè latte, is mixed with a spiced tea concentrate instead of espresso. By 1994, the term had gained currency on the U.S. coffeehouse scene. Unlike many teas, which are brewed in water with milk later added, traditional masala chai is often brewed directly in the milk. Tea plants have grown wild in the Assam region since antiquity, but historically, Indians viewed tea as an herbal medicine rather than as a recreational beverage. Some of the chai masala spice mixtures, or karha and Kashayam (Kha-shai-yam) that are still in current use, are derived from ancient Ayurvedic texts. In the 1830s, the British East India Company became concerned about the Chinese monopoly on tea, which constituted most of its trade and supported the enormous consumption of tea in Great Britain around one pound (by weight) per person per year. British colonists had recently noticed the existence of the Assamese tea plants, and began to cultivate tea plantations locally. In 1870, over 90% of the tea consumed in Great Britain was still of Chinese origin, but by 1900, this had dropped to 10%, largely replaced by tea grown in British India (50%) and British Ceylon (33%), present-day Sri Lanka. However, consumption of black tea within India remained low until the promotional campaign by the (British-owned) Indian Tea Association in the early 20th century, which encouraged factories, mines, and textile mills to provide tea breaks for their workers. It also supported many independent chai wallahs throughout the growing railway system. The official promotion of tea was as served in the English mode, with small added amounts of milk and sugar. The Indian Tea Association initially disapproved of independent vendors' tendency to add spices and greatly increase the proportions of milk and sugar, thus reducing their usage (and thus purchase) of tea leaves per liquid volume. However, masala chai in its present form has now firmly established itself as a popular beverage. 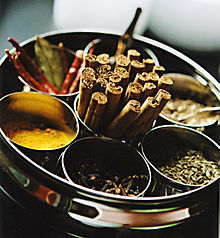 Spices used for masala chai. The recipe or preparation method for masala chai is not fixed, and many families have their own versions of the tea. Most chai contains caffeine, typically one-third that of coffee (if made with a black tea base). The tea leaves steep in the hot water long enough to extract intense flavour, ideally without releasing the bitter tannins. Because of the large range of possible variations, masala chai can be considered a class of tea rather than a specific kind. However, all masala chai has four basic components: milk, sugar, cardamom, and ginger. The western adaption of chai, or chai latte, has a lighter and sweeter taste than the Indian version of a more herbal and spicier milk beverage. The base tea is usually a strong black tea such as Assam, so the spices and sweeteners do not overpower it. Usually, a specific type of Assam is used called mamri. Mamri tea has been cured in a special way that creates granules as opposed to "leaf" tea. It is inexpensive and the tea most often used in India. However, a wide variety of teas is used to make chai. Most chai in India is brewed with strong black tea, but Kashmiri chai is brewed with gunpowder tea. Spices and cut tea leaves. The traditional masala chai is a spiced beverage brewed with different proportions of warming spices. The spice mixture, called karha, uses a base of ground ginger and green cardamom pods. Other spices are usually added to this karha. For example, some masala chai found on the street, in restaurants, or in homes may also incorporate one or more of cinnamon, star anise, fennel seeds, peppercorn, nutmeg, and cloves. In the Western world, using allspice, to either replace or complement the cinnamon and clove, is also common. Traditionally, cardamom and ginger play a dominant note, supplemented by other spices such as cloves, or black pepper; the latter two add a heat to the flavour and the utilization of cloves is more typical and popular throughout India. The traditional composition of spices often differs by climate and region in Southern and Southwestern Asia. For example, in Western India, cloves and black pepper are expressly avoided. The Kashmiri version of chai is brewed with green tea instead of black tea and has a more subtle blend of flavourings: almonds, cardamom, cinnamon, cloves, and sometimes saffron. In Bhopal, typically, a pinch of salt is added. Other possible ingredients include nutmeg, mace, black cardamom, chilli, coriander, rose flavouring (where rose petals are boiled along with the loose-leaf tea), or liquorice root. A small amount of cumin is also preferred by some people. Traditionally in India, water buffalo milk is used to make chai. Outside of India, whole-fat cow's milk is usually used. Generally, masala chai is made by mixing one part milk with two to four parts water and heating the liquid to near boiling (or even full boiling). Some people like to use sweetened condensed milk in their masala chai to double as the sweetener. For those who prefer to drink chai without milk, the portion is replaced with water. Plain white sugar, Demerara sugar, other brown sugars, palm or coconut sugars, syrup, or honey is used. Jaggery is also used as a sweetener, mostly in rural parts of India. While some prefer unsweetened chai, some sugar enhances the flavour of the spices. Some recipes use up to three tablespoons of sugar in 3½ cups of chai. Sugar is typically added to suit the drinker. A boy in Mysore, India preparing masala chai: As it is prepared by decoction, preparation usually includes straining tea from the solids. The simplest traditional method of preparing masala chai is through decoction, by actively simmering or boiling a mixture of milk and water with loose-leaf tea, sweeteners, and whole spices. Indian markets all over the world sell various brands of chai masala, (Hindi चाय मसाला [chāy masālā], "tea spice") for this purpose, though many households or tea vendors, known in India as chai wallahs, blend their own. The solid tea and spice residues are strained off from masala chai before serving. The method may vary according to taste or local custom; for example, some households may combine all of the ingredients at the start, bring the mixture to a boil, then immediately strain and serve; others may leave the mixture simmering for a longer time, or begin by bringing the tea leaves to a boil and only add the spices toward the end (or vice versa). A common Maharashtrian practice for preparation of one cup of chai is to first combine one half cup of water with one-half cup of milk in a pot over heat. Sugar may be added at this point or after. Ginger is then grated into the mixture followed by adding a "tea masala". 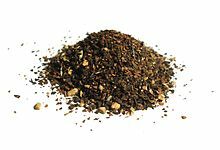 Although the ingredients may vary from region to region, "tea masala" typically consists of cardamom powder, cinnamon powder, ground cloves, ginger powder, and pepper powder. The mixture is brought to a boil and 1 teaspoon of loose black tea is added. The chai is immediately taken off the heat, covered, and allowed to sit for about 10 minutes to allow the black tea to infuse into the chai. The chai is then strained and served. A man in Kolkata, India, with a chaidaan for serving nine glasses of chai. Masala tea is a very popular beverage in the Indian subcontinent (India, Pakistan, Bangladesh, Nepal and Sri Lanka). Small, roadside businesses called chai walla, make and deliver tea to people's places of business in a chaidaan, a wooden or metal frame carrier for cups. Masala tea is a beverage that is consumed heavily all across Indian household. While most people like to consume it in the morning along with breakfast, it is also offered to any guests that visit. A soy vanilla chai latte served in Berlin. As the popularity of masala chai has spread around the world, its nature has changed in various ways beyond the somewhat redundant terminology noted above. Masala chai is popular in East Africa, particularly on the coast. It is also quite popular in the UAE, Qatar, Kuwait and Saudi Arabia; but it's locally known as Karak Tea or Chai Karak شاي كرك. Liquid "chai concentrates" have become very popular for their convenience, as these spiced, sweetened, tea-based syrups merely require dilution with milk, water, or both to create a flavourful hot or cold beverage. Most American coffeehouse chains use commercial liquid concentrates instead of brewing their own chai from scratch. Dry powdered or granular mixes similar to instant coffee are also commercially available. Chatillon Chai is a tea concentrate blend originating from the Basque region in the 18th century. Both dry instant mixes and liquid concentrates can be replicated at home. A liquid concentrate can be made by brewing an unusually concentrated pot of highly spiced tea, so that the dilution of a small amount into a cup of hot water or a glass of cold milk results in roughly the same concentration of tea as in a normally proportioned brew; e.g., to make a syrup from which one ounce suffices to make one eight-ounce cup of normal chai when diluted, brew tea (and the proportional quantity of spices) at eight times normal concentration. Similarly, unsweetened iced-tea powder can be tailored to individual taste with powdered spices, sugar, and (if desired for convenience and texture) dry nonfat milk and dry non-dairy creamer; the result can be mixed with hot water to produce a form of instant chai masala. This form of dry mix has certain disadvantages, however; the powdered spices may leave a grainy residue at the bottom of the cup, and it may dissolve poorly in cold water, especially in the presence of dry milk/creamer powders. Many Western supermarkets offer teabags of chai which contain an assortment of ground chai spices and require steeping in hot water. Some American supermarkets also carry bottles of "chai spice" alongside their dried herbs and other spices. Unlike Indian spice mixtures, the American ones are generally made from powdered spices (cassia tends to be the dominant flavour) and sometimes sugar; this mixture can be added last minute to an already-brewed cup of tea as straining off the solids is not needed. As an alternative to the hot tea format, several types of cold "chai" beverages have become popular in the United States. These range in complexity from a simple spiced iced tea without milk to a slush of spiced tea, ice, and milk (or nondairy creamer) mixed in a blender and topped with whipped cream. It is essentially different from the original version of a hot beverage. Many Western commercial preparations use nontraditional ingredients such as vanilla or chocolate, relegating the traditional masala spices to a relatively minor role. Non-tea-based variants may be prepared with herbal teas or with the South American beverage yerba mate. Some coffeehouses in the United States offer a version of masala chai augmented with espresso, but this beverage does not have any one universally recognised name. Depending on the establishment, it may be called "java chai", "red eye chai", "chai charger", "tough guy chai", "dirty chai", or many other different names. However, despite the common use in many localities to use the term "latte" as an abbreviation of "caffe latte" ("cafe latte"), the term "chai latte" does not generally imply the presence of coffee in the beverage; see the discussion of the terminology above (literally, latte is Italian for "milk"). ^ "A Brief History of Chai and 5 to Try (or Retry) This Fall". Retrieved 5 September 2016. ^ "Origin of Masala Chai – Chai Pilgrimage". Retrieved 5 September 2016. ^ "The History of Masala Chai (a.k.a. "Chai Tea")". Retrieved 5 September 2016. ^ "Definition of CHAI". Retrieved 5 September 2016. ^ "the definition of chai latte". Retrieved 5 September 2016. ^ Sari Edelstein (2011). Food, Cuisine, and Cultural Competency for Culinary, Hospitality, and Nutrition Professionals. Jones & Bartlett Learning. pp. 377–. ISBN 978-0-7637-5965-0. ^ Rosen, Diana. Chai: the Spice Tea of India. Pownal, Vermont: Storey, 1999. ^ M., Gilbert, Richard (1986). Caffeine, the most popular stimulant. New York: Chelsea House Publishers. p. 24. ISBN 9780877547563. OCLC 12970317. ^ Collingham, Lizzie. (2006). "Chai: The Great Tea Campaign". In Curry: A Tale of Cooks & Conquerors, pp 187-214. New York: Oxford University Press. ISBN 0-19-517241-8. ^ Sara Perry (1 Aug 2001). The New Tea Book: A Guide to Black, Green, Herbal and Chai Teas. Chronicle Books. p. 40. ISBN 9780811830539. ^ "What is a chai wallah?". Chai Wallahs of India. 2013-04-20. Retrieved 30 November 2013. ^ "10 objects that define Indian design". 2018-07-20. ^ Munishi, Michael Oresto; Hanisch, Rachel; Mapunda, Oscar; Ndyetabura, Theonest; Ndaro, Arnold; Schüz, Joachim; Kibiki, Gibson; McCormack, Valerie (2015-08-06). "Africa's oesophageal cancer corridor: Do hot beverages contribute?". Cancer Causes & Control. 26 (10): 1477–1486. doi:10.1007/s10552-015-0646-9. ISSN 0957-5243. PMC 4838015. PMID 26245249. ^ Planet, Lonely; Fitzpatrick, Mary; Ham, Anthony; Holden, Trent; Starnes, Dean (2012-06-01). Lonely Planet East Africa. Lonely Planet. ISBN 9781743213124. ^ "Chai Karak: The Popular Drink That's Rapidly Spreading in the Gulf". Khaleejisque. 2011-09-28. ^ "Tazo® Chai Frappuccino® Blended Crème | Starbucks Coffee Company". Starbucks.com. Archived from the original on 2012-08-05. Retrieved 2012-08-13. ^ "What's a Dirty Chai?". The Spruce. Retrieved 2018-01-31. ^ Travis., Arndorfer (2006). The complete idiot's guide to coffee and tea. Hansen, Kristine. New York: Alpha Books. p. 120. ISBN 9781440626012. OCLC 489450263. Wikimedia Commons has media related to Chai. This page was last edited on 25 March 2019, at 05:25 (UTC).